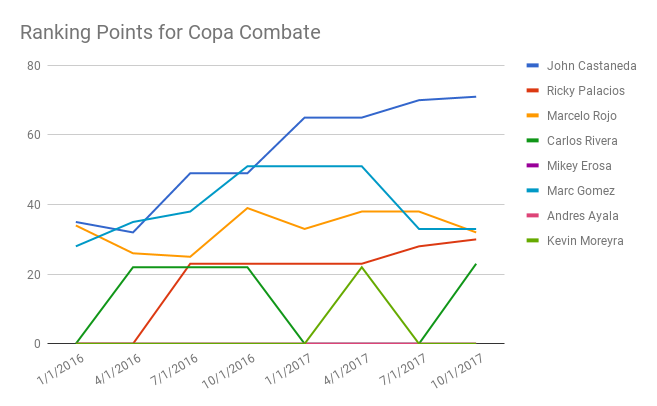 As you can see, Castaneda seems to be a pretty big favorite from a ranking perspective. Plus, he is coming off a victory over Cheyden Leialoha in Dana White’s Tuesday Night Contender Series. 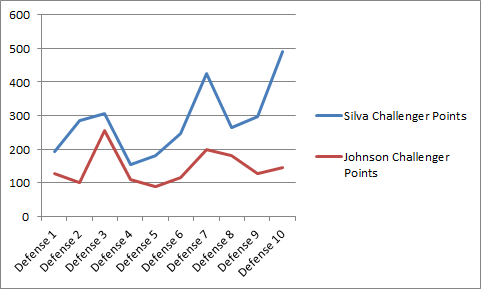 As you can seen in the following chart, he appears to have the most consistent upward career trajectory. 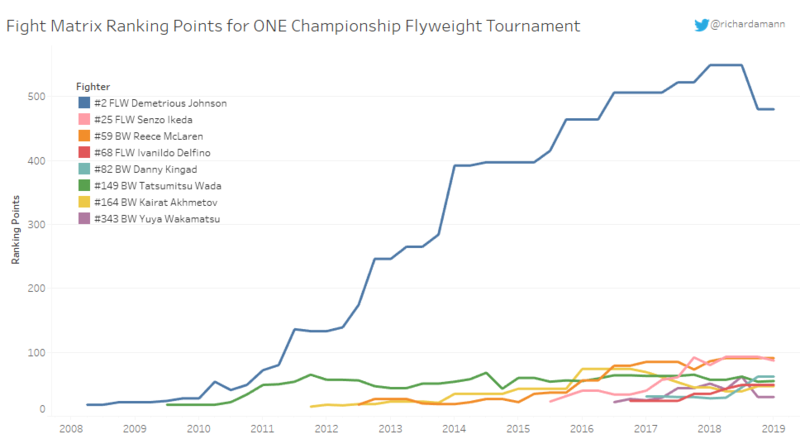 Will he be able to keep this up and take the tournament title? The winner is expected to face newly signed UFC veteran #21 BW Erik Perez, who would be a step up in competition for all participants in this tournament. 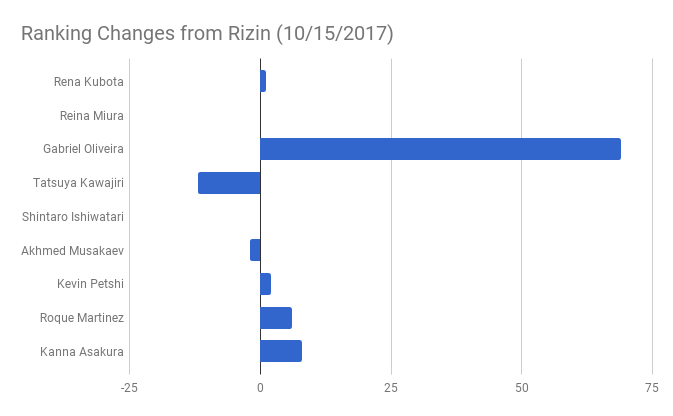 The following chart shows the change in ranking following this past weekend’s Rizin event. Gabriel Oliveira was the biggest winner from the event. He moved up 69 spots in the bantamweight rankings thanks to his victory over veteran Tatsuya Kawajiri. 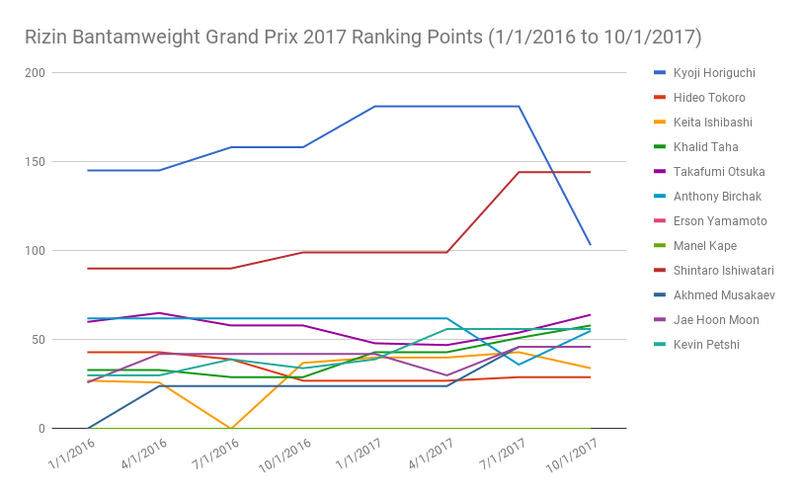 The chart only includes fighters who were previously ranked in the same weight class. 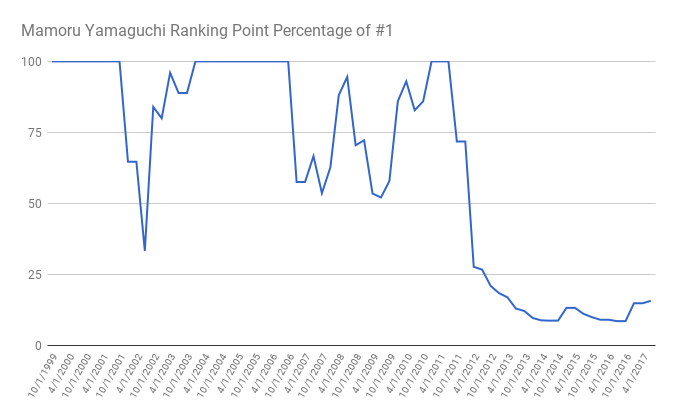 How did Ben Askren drop 44 spots in the rankings without losing? 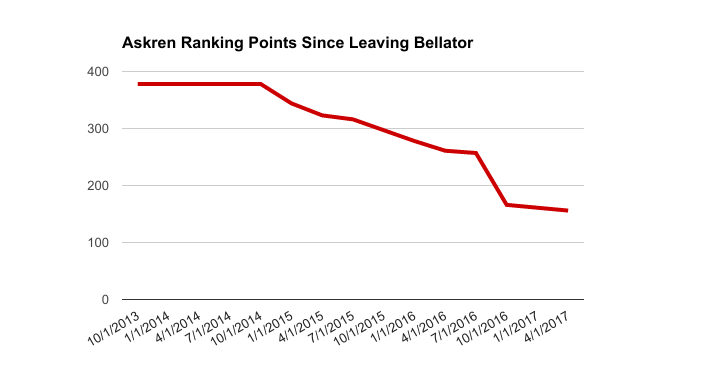 Askren left Bellator in 2013 and signed with ONE the following year. During his Bellator run, he went 9-0, won the promotion’s welterweight title and defended it four times. 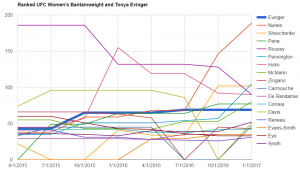 At the time, many expected the Olympic wrestler to sign with the UFC. He even posted on Twitter, “I am now free to go to the UFC and beat whoever I want.” Instead, fans were treated to a never-ending war of words between Askren and UFC president Dana White. 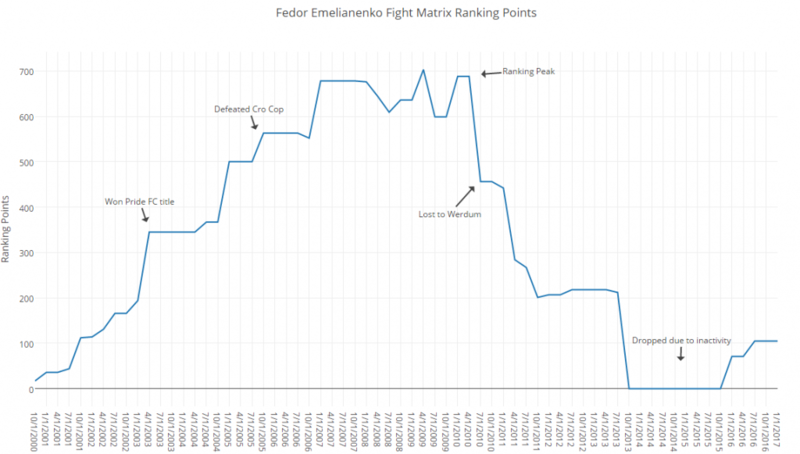 During his time in ONE, his ranking has fallen from #6 welterweight in 2013 all the way to #50 in the current ranking release. 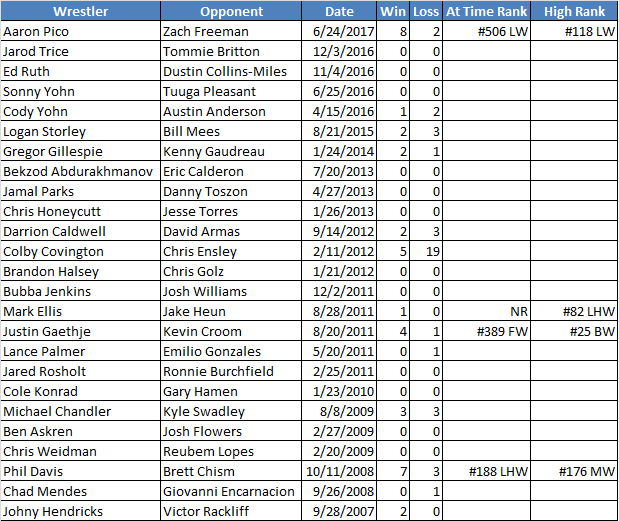 This is partially due to inactivity, but his lack of quality opponents is the main impetus for the drop. In 2014, Askren made his ONE debut with a first-round submission victory over Bakhtiyar Abbasov. He then returned and bested Nobutatsu Suzuki for the promotion’s welterweight title. The following year, he fought to a no contest with Luis Santos after Askren landed an accidental eye poke. 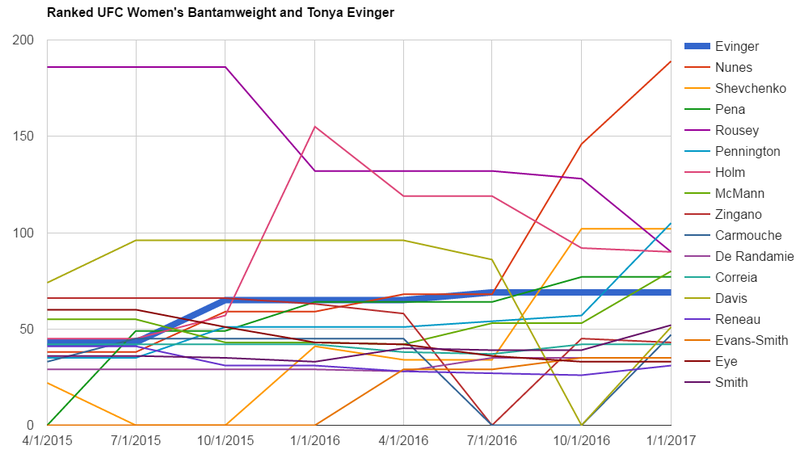 The two were supposed to rematch, but Santos missed weight and ate too much brunch, so the fight never materialized. Last year, Askren defeated Nikolay Aleksakhin.